Selling for $28 0 0 Like this product? Crafted of durable ceramic stoneware, these coffee confidants features a one of a kind his and her design, heart shaped handles and puzzle piece fit. Morning coffee will become cute with these Personalized Heart Mugs.A fantastic & lovely gift idea! Morning coffee has never looked cuter than with these Personalized Heart Mugs. Crafted of durable ceramic stoneware, these coffee confidants feature a one of a kind his and her design, heart shaped handles and puzzle piece fit. With fun personalization, you simply can't go wrong giving this as a gift. So, round up your coffee drinking buddies and toast to a classic morning a tradition! Dishwasher and microwave safe. Size: Mugs hold up to 10 ounces. 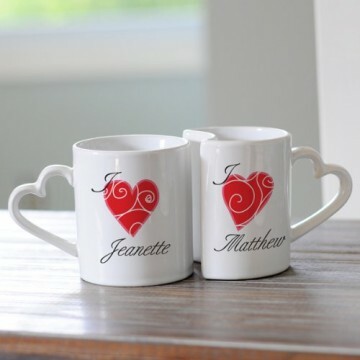 The Personalized Heart Mugs may each be engraved with a single script first name (max of 12 characters per name) following an accompanying "I" and red heart design. Cathy’s Concepts had been a leading manufacturer & drop shipper of wedding accessories and personalized gifts since 1989. Cathy LaValley, founder and sole owner, is actively involved in all aspects of the company. Complete in-house design, photography, and marketing department that allows us to offer our customers on trend innovative products, professional web-ready images, & product descriptions. Personnel that provide your web team with concise and accurate product specifications, including spreadsheets and photography. Our expertise will accelerate the loading process of our products to your ecommerce website. State of the art distribution center where we pick, personalize, pack, and ship all in stock orders within 2 business days. Centrally located distribution center that enables our shipments to reach 80% of the country within 2 business days and we are also a 3rd party fulfillment provider. We can personalize and ship your products for you. MG Collection Metal Studded Soft Leatherette Shopper Hobo Shoulder Bag - Gift for your loved ones. ©giftfantasia.com 2019. All Rights Reserved.